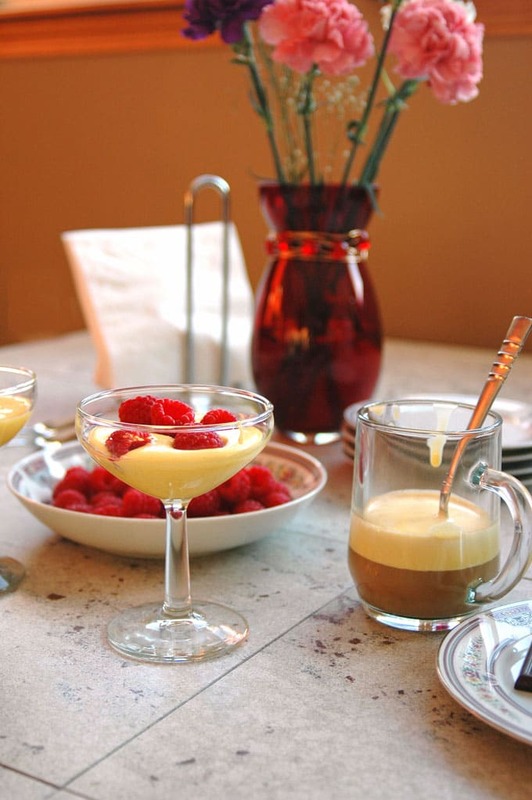 You must try Breakfast Zabaglione with Berries and Espresso! A non-alcoholic, custard-like treat that’s so delicious! Welcome to my Italian continental breakfast. 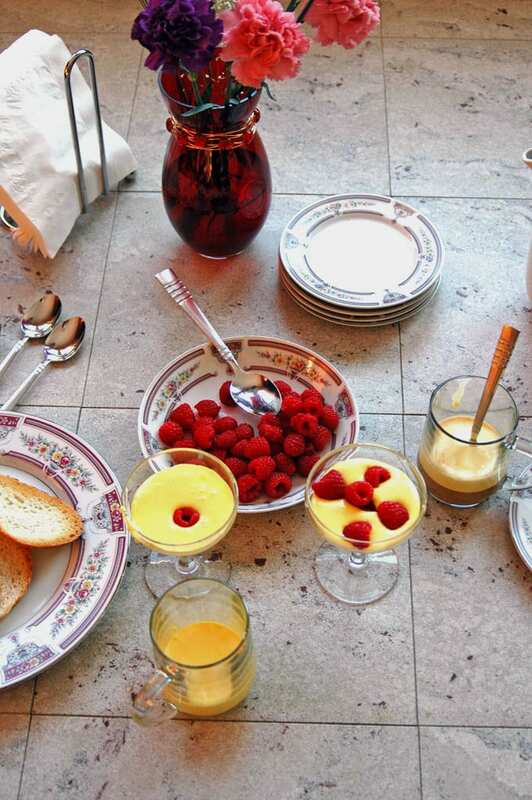 We have non-alcoholic breakfast zabaglione (zah-bah-yoh-nay) with berries and espresso, toast and some dark chocolate. This is what I want the morning of Valentine’s Day or any holiday, for that matter. 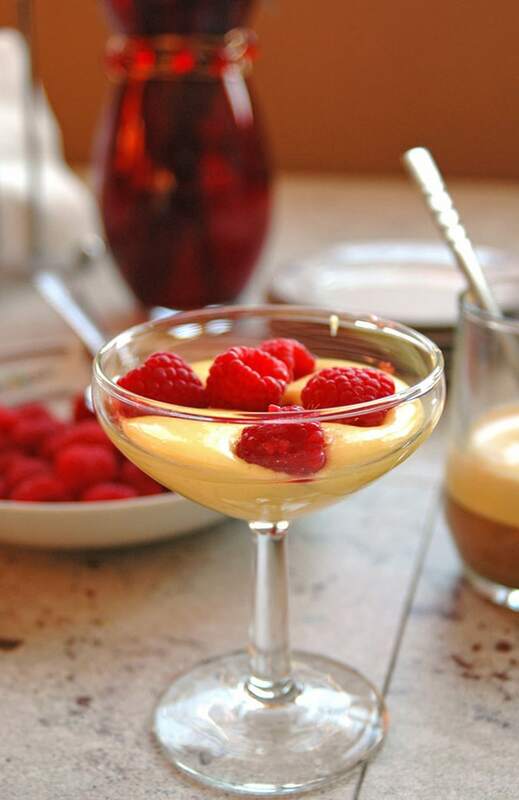 If you’ve heard of zabaglione, you might know it as a custard-like dessert made with sweet wine. I only know the non-alcoholic version that Nonna used to make for us as a special breakfast treat. She served it just like in Italy, nice and sweet with espresso poured over it and toast on the side for dipping. Heaven! And yes, I occasionally consumed coffee as a kid, either poured over this zabaglione or on my cereal. And I drank red wine mixed with pop every Sunday at dinner. Nonna used just two ingredients in her zabaglione: raw egg yolks and sugar. I cooked mine over a double boiler for food safety reasons, but otherwise, I’ve stayed true to her version, only adding a couple dashes of salt to bring out the flavor. It’s rich, creamy, and out-of-this-world delicious. You can adjust the sugar level to your liking, but keep in mind that if you’re going to add unsweetened espresso to yours (for the love of coffee, you must! 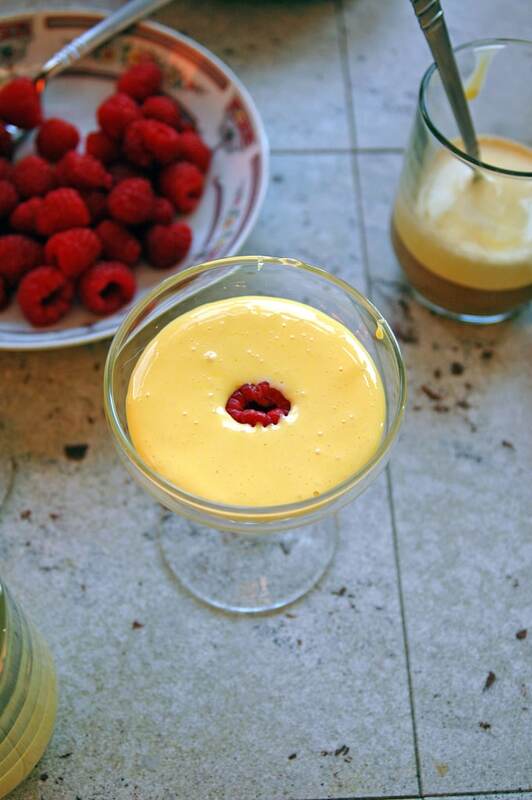 )you’ll want the zabaglione sweet enough to compensate. 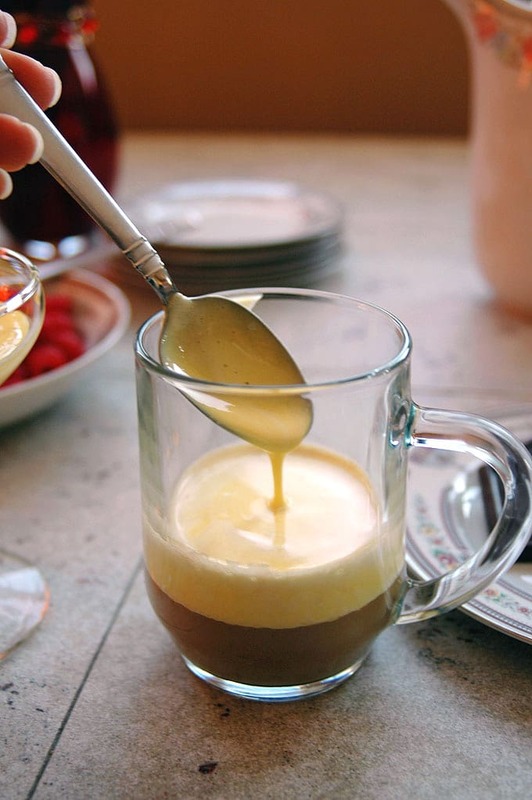 Okay, I beg of you, if you drink coffee, you must experience it with the luscious zabaglione in your cup! The zabaglione will swirl around for a bit in the espresso, then the whole thing will look cloudy, and then the zabaglione will rise to the top. You’ll dip your spoon in and take a scoop…and the taste will make you weak in the knees and you’ll roll your eyes swooning. At least, that’s what happens to me. If you like tiramisu or coffee ice cream, your life will not be complete until you’ve tried this! I guess I’d better wrap this up by saying a few words about the cooking process. You’ll need lots of eggs. Then, you’ll need to whisk your ingredients for at least 10 minutes to achieve the right consistency. It helps to make figure eights with the whisk to incorporate air and keep your arm from getting too tired. 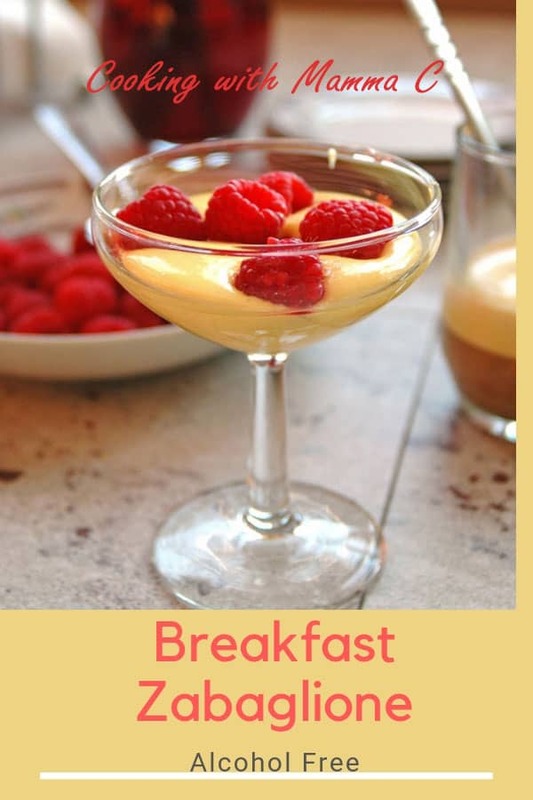 If you’ve never had breakfast zabaglione, I hope you try making it! Just Dorothy Hamill your way through it, and you’ll be fine. Egg yolks, sugar, a bit of salt and some whisking over a double boiler will give you this creamy, custard-like Italian treat. Serve it with berries, toast for dipping, and you must try it with espresso poured on top! Separate the yolks from your eggs. It helps to set a fine-mesh strainer over a container to catch the egg whites. (Crack your egg, let the whites ooze out, and transfer the yolk back and forth between the two eggshell halves until the whites have all dripped out.) Reserve the whites for another use. Place your yolks into a stainless steel or glass bowl that fits on top of your pot. Add the sugar and salt to the egg yolks in the bowl and whisk them briefly before placing the bowl on top of the pot of simmering water. Continue whisking, using a figure 8 motion, for at least 10 minutes. Periodically check the water underneath to make sure it's not boiling. Lower the heat if you need to, so the water stays simmering. The zabaglione is done when it is thick and pulls away from the sides of the bowl, starting to gather in the middle. The color will be a paler yellow than when you started. It should not be as thick as custard. 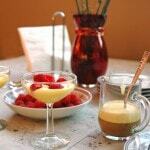 To serve, immediately spoon the zabaglione into coffee mugs or stemmed glasses. Serve with berries, toast and unsweetened espresso. The espresso can be poured over the zabaglione. I grew up with eating this in the morning too, except my mom never used a double boiler. just yolks and sugar. Sometimes I would add it to my espresso. Just made this the other night. Sooo good! Hi Maria – Yeah, in the old days, I don’t think anyone worried about whether the yolks were cooked. 🙂 I’m so glad you enjoyed the zabaglione! Oh my gosh!! My mom used to make this for me every morning when I was a kid! She would beat an egg yolk with a good amount of sugar in a coffee cup and then I would eat it just before going to school. Once in a while she also added espresso. 🙂 My grandparents always let me drink a little bit of red wine with plenty of 7-Up. If I was lucky, I was allowed to drink a second glass. Times have sure changed, though. 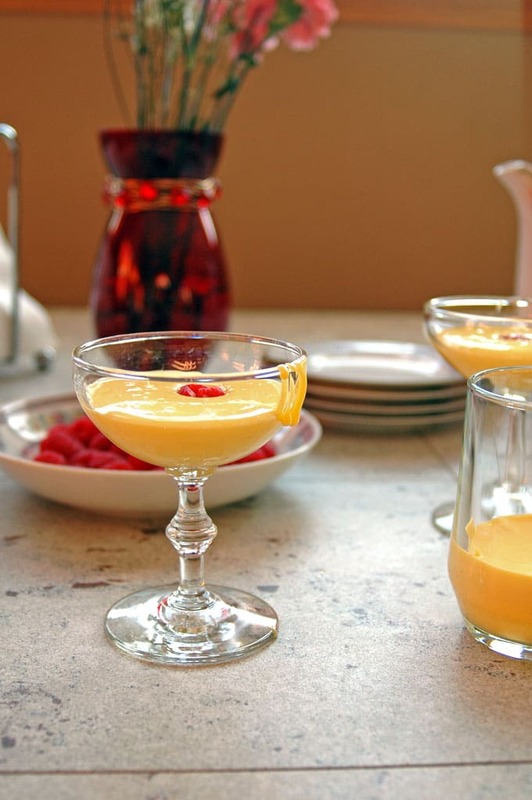 I would let my kids try the breakfast zabaglione but I wouldn’t let them try wine with 7-Up. Wine with 7-Up! For us, it was Riunite. Too funny! I’m so glad you shared your memories with me, Rosa. I need to make zabaglione again soon! Hi Andrea, my Nonna loved to serve this with blueberries (because she had a blueberry patch out back, I think?). It was a fun flavorful treat. No wine in soda pop for me-that was a big no-no. I loved coffee though loaded with cream and sugar! Then dunk the cinnamon toast strips in the coffee (and make a real mess!). To this day I love coffee (Columbian) loaded with half and half and sugar! Your Florida Bud, Cheryl. PS Have a Happy Valentine’s Day!!! Cheryl, I bet the cinnamon toast is delicious in coffee. In fact, my cousin in Italy said that zabaglione is often served there with cinnamon or pistachio nuts. Blueberries sound so good too. I’ll take some of each! I am dying at the image of you drinking red wine mixed with soda pop 😉 This looks so good in the coffee! I am such a coffee fan, this looks like the most delicious way to enjoy a nice cup. This looks wonderful, Andrea! Being Italian, you’d think I grew up eating zabaglione, tiramisu, and drinking a little wine…nope – none of it! I have a lot of lost time to make up for! Thank you for sharing your Nonna’s sweet recipe! This looks really good! I had never heard of this dish before but I definitely look forward to trying it! I love hearing that, Shelby. I hope you enjoy it!